Saint Urbain is a pilgrim of God and a devout believer in Miracles. He puts his faith in his Lord that prayer and worship will rid Boletaria of the Demons. He has many followers, few of which accompany him in the Nexus. If Patches is dead, Saint Urbain will still be at the bottom, so just jump down to find him. Saint Urbain is a simple fighter. When hostile, he will constantly strafe or back away. If you pursue him, he will cast Rage of God (God's Wrath), which has potential for massive damage. It has a slow cast, however, and can be dodged by 2 or 3 quick rolls backward. When the fight first begins, he will cast God's Wrath up to 5 times in a row if you are close enough. After this, he will simply avoid you for about 15 seconds then use it again. Then he waits 15 seconds and uses it again. You can just close the distance and strike him. His cast will be interrupted, and he'll try to roll away. He is weak to most damage types, though has shown a slight resistance to Magic. Either way you can kill him however you want. Stand far away and shoot an arrow just so the target stands up. Run up to the target and roll at and away from their starting position. If you manage to push them far enough away they will begin to walk back to their position. Dual wield your strongest weapon and backstab them while they are walking. You can get about 3 backstabs before they start being agro. The shrine Urbain is praying to houses a Talisman of God, although you cannot take it. This is how Urbain probably "speaks to God", through the Talisman of God itself. It makes sense since it is supposedly a channel through which God works. Urbain may disappear from the hole in 4-2 as part of what seems to be a larger glitch involving Patches. He won't re-appear until the next game cycle. Heavens, did you fall for that little devil's trap? Well, I did the same. He fooled me, and now I am stuck here. The reverberations seem to suggest that we are connected to the outside. But dark, fearsome souls stand between us and freedom. But have no fear, God will cleanse us of evil. Did you cleanse the world of another dark soul today? God has chosen you, and for that we are thankful. Thanks to you, I was able to seek refuge in this Nexus. Now I stay here and pray, along with my disciples, for the heroes facing the Demons. 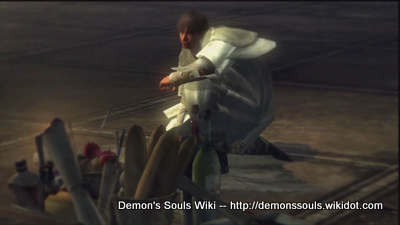 If you wish for benevolent protection in your fight against the demons, then bring me Demon Souls. I will cleanse them, and perform a miracle with their power. If you truly are a disciple, then you must have a talisman in God's image. Heavenly miracles occur in Boletaria through the talismans. God has granted this accursed land with a special power. It is God's way of telling us we must stand up to the Demons. After the dark arts spread across the land, holy miracles were witnessed once again. The will of God is clear. We must defeat the Demons, annul the curse of Boletaria, and purge the evil magicians who manipulate those accursed souls. As you know, souls are a source of evil power emanating from the Demons. King Allant was overcome by a lust for such power, and has placed Boletaria in her present predicament. Ah, Astraea of the Valley of Defilement? I am not sure, but Saint Astraea of the West was accompanied by the knight Garl Vinland. She would never turn to evil with that upstanding knight to guide her. Surely it is mere slander. Sadly, the weak are prone to such backstabbing. Bito the Moonlight Knight, Lizaia of Istarel, and Selen Vinland. Many honourable knights have ventured into Boletaria in search of the Valley of Defilement. The vicious rumours about Astraea offend our most basic sense of respect for God's name. However, none of these great knights has made it back. Could it be that the wretched valley is so infested with grime that even our Lord's voice does not resonate there? From where does that howl come?! That is no Demon. It sounds more like a poor hungry child. Something about it sets me at great unease. May God watch over us. Bless us, and all of Boletaria. Oh, is that you again? Do you have further gifts to offer? I certainly cannot force you to do anything. But you must remember this. A Demon's Soul is a source of evil power. God bless this brave warrior. What are you doing? Have the souls driven you mad? You will anger the heavens.